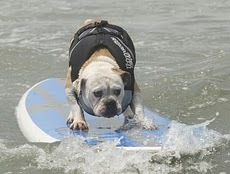 Being a city dog, Buddy is more into skateboarding, but he could appreciate those of his fellow canines who took to the waves off of San Diego this past weekend as part of the Loews Coronado Bay Resort Surf Dog Contest. This entry was posted on Monday, June 6th, 2011 at 10:20 AM. It is filed under Blog. You can follow any responses to this entry through the RSS 2.0 feed.